February is African American History Month. I don’t pretend to be an expert on the history of African-Americans but I am very grateful for the great contributions they have made. One of the contributions I especially love is that of food. A typical term for food that was derived from African dishes in the Southern United States is “Soul Food.” That includes food such as gumbo, fried chicken, chicken fried steak, black-eyed peas and hush puppies, just to name a few. 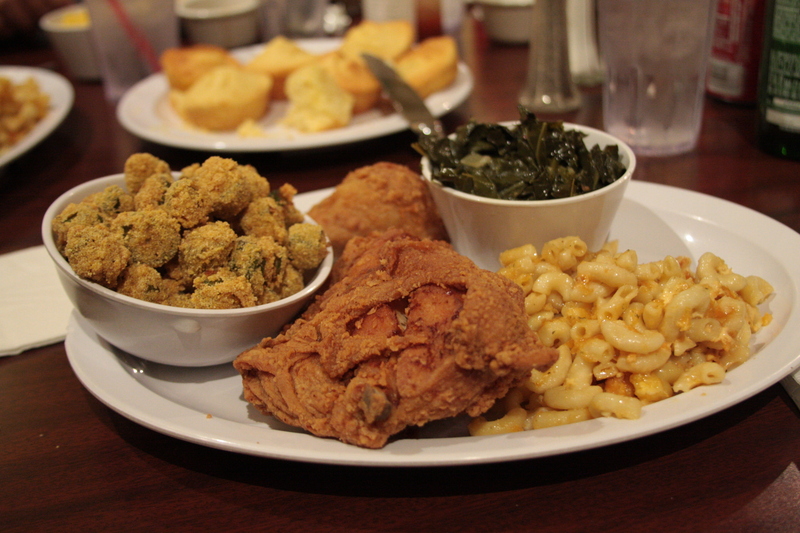 The term “soul food” gained popularity in the 1960s from Alex Haley’s recording of Malcolm X’s life story. However, the actual food is much older. Soul food originally came about from the slaves which were taken from Africa. It uses many ingredients that are common in West African cuisine such as rice, and okra. Those ingredients were staples among slaves. Slaves started using other local ingredients like corn and collard greens. Also, because of their situation, they were forced to cook leftover parts of livestock such as ham hock, oxtail and tripe. Over the next decades, with slavery being abolished and descendants of the slaves having access to better and more ingredients, the food was able to be refined, while still keeping many of same spices and flavors. One of the best things about soul food is that at its core, it is a food to be shared. One of my favorite scenes from Disney’s Princess and the Frog, which is a movie that features many soul food dishes, is when young Tiana and her dad make gumbo for their whole neighborhood. They were a poor family, yet they made a meal and invited everyone to partake. It brought together the community and was enjoyed with warmth and smiles. The true soul of soul food is the comfort, warmth and community it brings. So this month, as you reflect upon the great contributions that have come from our African-American friends, families and ancestors, cook up some soul food that can be shared with your community. In a large stock pot, over medium heat, add the oil. When the oil is hot, add the okra. Season the okra with salt and cayenne. Fry the okra, stirring constantly, for 10 to 12 minutes, or until most of the slime disappears. Add the onions, celery, peppers, and tomatoes. Season with salt and cayenne. Continue cooking, stirring often for 18 to 20 minutes, or until the okra and other vegetables are soft and the slime has completely disappeared. Stir in the garlic and bay leaves. Season the diced fish with Essence. Add the fish to vegetables and cook for 2 minutes. Add the fish stock. Bring the liquid up to a boil and reduce to a simmer. Simmer for 15 minutes. Season the shrimp and crawfish with Essence. Add the seasoned seafood and crabmeat to the pan. Add the file and continue to simmer for 5 minutes. Stir in the green onions and hot sauce. Remove the bay leaves and serve over the rice.